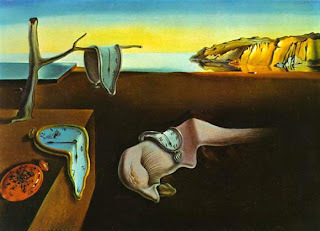 The Persistence of Memory is one of Dali's most famous paintings. In the painting there are objects such as melting clocks, a dead creature on the ground, and water and mountains in the background. The point of showing melting clocks is to imply the irrelevence of time. Time itself is not important; how we use our time is what matters. The lighting in this work is quite interesting. The mountains and lake in the background are lit up, while the images close by are in the shade. I recall hearing before that Dali was also a philosopher and perhaps the images in the shade represent what is in our subconscious mind. We usually focus on what is in front of us, rather than thinking about the meanings behind things, such as time's irrelevance. Also, by showing these shaded images up front and close to the viewer, we are more likely to pay attention to them than everything else. The contrast is also amazing. I love how he used the light colors compared to the dark colors. It really makes everything in the painting stand out so there are no spots that are boring or dull to look at.I chose this painting not only because it is one of my favorites, but because the symbolism is incredible. Salvador Dali loved to imply meanings by using the philosophy he studied, which also interests me. In this painting he shows these familiar objects in ways we have never seen them before. This is an intersting way to get a viewer involved in wondering what the true meaning of a painting is.